The willows or Salices ore an extremely varied and complex genus; some 300+ species are recognised worldwide. They range from minute, prostrate shrubs to large trees. Many species hybridise freely and many varieties, cultivars, hybrids are known. Even the BSBI handbook on "Willows and poplars" warns that 'no willow key yet devised will prove infallible'. Many willow species / hybrids are noted for the ease with which they reproduce vegetatively. Various willows were present in the U.K. after the last ice age, but it is difficult to know which due to their 'penchant' for hybridisation. Willows are generally plants of wetter areas / soils. 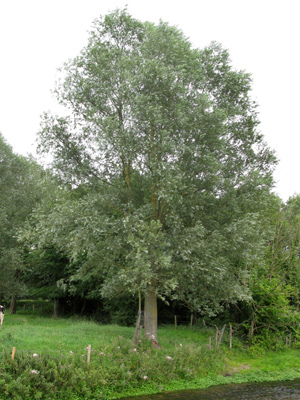 The White Willow (Salix alba), the Crack Willow (Salix fragilis) and the Osier (Salix viminalis) are species which may be found in the British Isles, often associated with river banks, wetlands and areas where water is generally available. 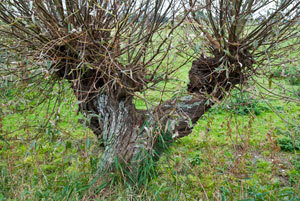 Willows have long been associated with making of baskets, hurdles, plant supports, and of course cricket bats. The finest are crafted from Salix alba coerulea which grows to 30m high and 4 - 6m in girth in nature, but the growing of wood for cricket bats is a specialised procedure. More recently, there has been interest in willows as a form of biomass, grown for fuel and regularly coppiced. Like many willows, the leaves of the white willow are long (between 5 and 10 cm) and pointed. They alternate along the stems. When they are first formed they are quite 'silky', that is covered with minute hairs. As they mature, the upper surface becomes 'naked' or glabrous and a dull green colour. The underside of the leaf remains silver - downy - so that at a distance, the leaves give a silver- white appearance, particularly as they move in the wind. The leaves are finely toothed. 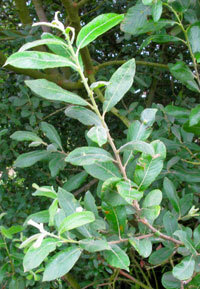 The leaves of the crack willow do not have this silvery appearance, they tend to be longer (up to 15 cm). 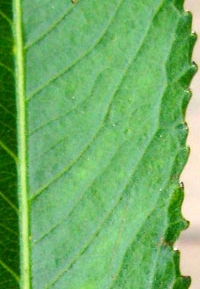 The foliage is a glossy green, with a 'blue-green' lower (abaxial) surface. The leaves of the Osier are particularly distinctive in that they are very long and thin - perhaps 20 cm by 1 cm; they are dark above, silky-white beneath and not toothed. 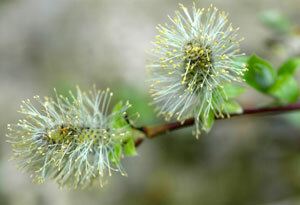 Not all willows have long, thin leaves, for example, goat willow (Salix caprea) has broader leaves. White willow tends to have a grey bark, with a number of ridges, that 'criss-cross'. New shoots tend to be slender, and softly hairy at first. The trunk tends to have large ascending branches or limbs. 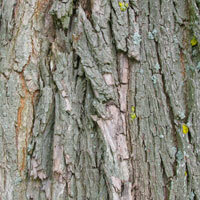 The crack willow bark is grey-brown and coarsely fissured in older trees (adjacent photo). 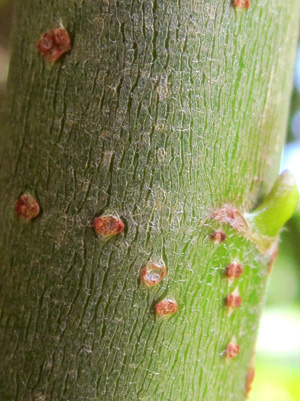 The shoots in crack willow are more yellow brown in colour, often shiny and hairless. They are brittle where they join with the stem, and will detach (in high winds or with a bit of a pull) - with a 'crack'. These 'fragments' readily root if they fall on mud or are transported by water to a moist place - if the temperature is suitable for growth. The trunk of the osier is short (by comparison to either crack willow or white willow), gnarled and scaly. The adjacent image shows the grain of willow. Willows are often pollarded and have a distinctive appearance. Many can be seen alongside the dikes in marshy areas in counties like Norfolk and Lincolnshire (see photo taken near Haddiscoe, Norfolk). 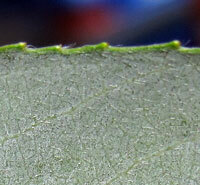 No photos available as yet - opposite is a young willow stem (with lenticels for gas exchange). The white willow has buds covered with greyish / white hairs and the young twigs have an olive / brown colour - again with hairs. By contrast, the crack willow has yellow brown buds with little or no hair, they are brittle and if bent at the best give rise to an audible 'crack'.. The osier has dark brown twigs that are hairy. 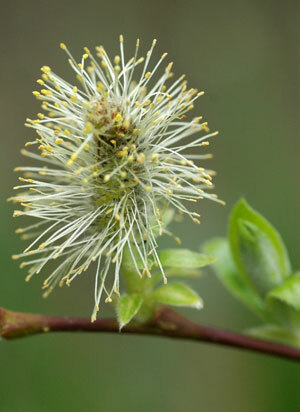 The image at the top of the page is of Salix alba var caerula - the cricket bat willow. Hybrids of the crack willow and the white willow are common, as are hybrids with the almond leaved willow.